Lock in a great price for Medora Auri Family Beach Resort – rated 8.7 by recent guests! Outstanding family hotel in the center of it all, directly on the beach and the walking promenade. Rooms were extremely comfortable and modern. Restaurant was very good with a wide variation of food and very good service. Front desk and concierge staff very nice and helpful. Beach and pool make this hotel a perfect 10! The view was amazing! The room was super clean and the staff at the front desk were welcoming and very nice! Comfort superior room had great sea views, food mornings and evenings is rich in choice, cooked food is tasty, with a very general European flavor, we missed a bit the local Croatian taste. Cleanliness is good and services are generally ok, unfortunately on the day of arrival we waited 40 minutes for a reception representative to come out and open the parking gate, although it was completely out of season and reception traffic was low. One thing that is upsetting any woman - the wardrobe had absolutely no shelves, just 5 hangers... Working staff in cafeteria and pool is pleasant, respectful, location is very nice with an ample sea shore access, we will return! Room was very modern, spacious and clean, as was the whole hotel. Excellent view from the room. Food was great, but should have more varieties. Excellent tasty food - a planty of choise - !! Excellent sea- and mountainsview! Excellent fitness room! Food, staff, room, the sea view, kids disco, kids playground and playroom, beach. The NotaBene restaurant belonging to the hotel has good food and staff. Big family resort with personal beach, few restaurants and bar. Our room was small but in very good conditions nicely decorated. Good wifi on all teretory. Medora Auri Family Beach Resort This rating is a reflection of how the property compares to the industry standard when it comes to price, facilities and services available. It's based on a self-evaluation by the property. Use this rating to help choose your stay! 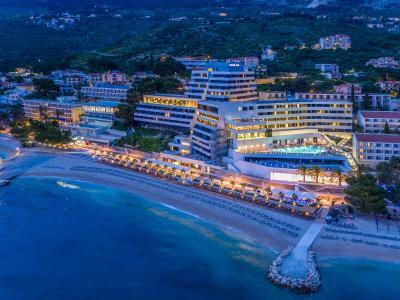 One of our top picks in Podgora.Completely refurbished in 2016, the beachfront 4-star Medora Auri Family Beach Resort features outdoor swimming pools and a wellness center with a variety of saunas, a whirlpool bath, a relaxation room and various massage and beauty treatments. A buffet restaurant with show cooking serves local and international specialties. Free WiFi is provided in all areas. Guests are welcomed in air-conditioned rooms that include a balcony overlooking the Adriatic Sea or the Biokovo Mountain. A flat-screen satellite TV and a mini-bar are also included, while private bathrooms feature a shower or a bathtub and free toiletries. A smartphone is provided in each hotel room for guests to use. A couple of bars, including a beachfront bar, a lobby bar with panoramic views of the surroundings as well as a pool cocktail bar, invite guests to relax and unwind. Sun loungers and parasols are provided by the pool free of charge, while the ones on the beach are available for rental at a surcharge. Guests can get in shape at the on-site fitness center that provides panoramic views of the Adriatic Sea. A children's playground caters to all age groups of children. A varierty of day and evening entertainment is provided for guests of all ages, while various sports activities can be enjoyed at the hotel or in the surrounding area and include outdoor tennis, jet ski, diving or parasailing. The city of Makarska is 6.2 mi away. Split Airport can be reached in 53 mi, while Dubrovnik Airport is at a distance of 99 mi. This is our guests' favorite part of Podgora, according to independent reviews. When would you like to stay at Medora Auri Family Beach Resort? This comfortable air-conditioned room includes a balcony overlooking the park and features a flat-screen satellite TV and a mini-bar. A private bathroom comes with a shower and free toiletries. Please note that this room is located in the adjacent pavilion building. This air-conditioned room consists of two separate bedroom, each with a balcony offering views of the Adriatic Sea. It also includes 2 flat-screen satellite TVs and a mini-bar. A spacious private bathroom comes with a shower and free toiletries. Please note that children up to the age of 15 stay free of charge in this room type. This spacious air-conditioned room consists of two separate bedroom, each with a balcony offering views of the Adriatic Sea. It also includes 2 flat-screen satellite TVs and 2 mini-bars. A large private bathroom comes with a shower and free toiletries. This air-conditioned room includes a balcony and features a flat-screen satellite TV and a mini-bar. A private bathroom includes a shower and free toiletries. This comfortable air-conditioned room includes a balcony with views of the Adriatic Sea and features a flat-screen satellite TV, a sofa and a mini-bar. A private bathroom comes with a shower and free toiletries. This air-conditioned room includes a spacious sea-view balcony furnished with sundeck chairs and features a flat-screen satellite TV, a sofa and a mini-bar. A private bathroom includes a bathtub and free toiletries. This air-conditioned room includes a spacious balcony furnished with sundeck chairs and features a flat-screen satellite TV, a sofa and a mini-bar. A private bathroom includes a shower and free toiletries. This spacious air-conditioned room consists of two separate bedroom, each with a balcony offering views of the Adriatic Sea. Every room also includes a flat-screen satellite TV and a mini-bar. A large private bathroom comes with a shower and free toiletries. A separate toilet is also provided. This suite comes with a spacious balcony furnished with sundeck chairs and offering views of the Adriatic Sea. It features a flat-screen satellite TV, a sofa and a mini-bar. A private bathroom includes a shower and free toiletries. This spacious suite is located on the top floor of the hotel and features a large furnished terrace providing views of the Adriatic Sea. It also has an additional balcony with views of the Biokovo Mountain. The suite consists of two bedrooms and includes a seating area with a flat-screen satellite TV, a sofa and a mini-bar. A dining room is also included. A spacious bathroom comes with a shower and free toiletries. This spacious suite is located on the top floor of the hotel and features a large furnished terrace providing views of the Adriatic Sea. It includes a seating area with a flat-screen satellite TV, a sofa and a mini-bar. A dining room is also provided, while a spacious bathroom comes with a bathtub and free toiletries. This air-conditioned room consists of two separate bedrooms, each with a balcony offering views of the Adriatic Sea. Every room also includes a flat-screen satellite TV and a mini-bar. A spacious private bathroom comes with a shower and free toiletries. This air-conditioned room consists of a a balcony offering views of the Adriatic Sea. The room also includes a flat-screen satellite TV and a mini-bar. A spacious private bathroom comes with a shower and free toiletries. This family room has a balcony, tile/marble floor and air conditioning. This family room features a balcony, tile/marble floor and mini-bar. It is intended for visitors who are looking for an authentic and intense holiday, those who want to experience tradition in a modern way. For those who want to hear local traditional stories, visit hidden unexplored locations that only the locals from Podgora know about and enjoy the clean sea, sunny beaches, and the shade of pine trees and the silence of the mountains. House Rules Medora Auri Family Beach Resort takes special requests – add in the next step! Medora Auri Family Beach Resort accepts these cards and reserves the right to temporarily hold an amount prior to arrival. Please note that the accommodations units are located in the main hotel building and the pavilion buildings. The pavilions can be reached via a short path that passes next to the swimming pool area. Parking could be organized better especially because you have to pay for it - if you return to hotel late at night you have to wait for someone from the hotel to open the gate for you and this can be annoying. 1) Poor access to rooms for a relatively new hotel... with multiple levels of stairs to navigate even after you are at your floor... 2) 10am check-out time... which is an hour to two hours earlier than most other places 3) Breakfast was fair... and only served until 9:30... and they actually start closing down earlier than that... 4) Only outside swimming pools, which are partially heated during the winter... but NO JACUZI and NO SAUNA and NO STEAMROOM available after 8 pm... and only as part of the “Wellness Center” which closes at 8 pm.... which renders these facilities impossible to use for many travelers. THE LOCATION OF THIS HOTEL AND THE BEACHES ARE VERY NICE, HOWEVER I WILL NOT EVER STAY HERE AGAIN... In MY BOOK, This was not a good value.